Last edited by ZiMMie; 11-21-2005 at 10:00 PM. Well, the type-e's look awesome on my car, it's just too late to drive around on them. I really want to get a set of BBS RS with a nice lip (15x8 or 16x8 or 9) What would be the appropriate offset that I should look for? I have also noticed that there is quite a few G60 RS's available in the 15x7 variety. Would these fit e30 if I decided to put a different lip to make them 15x8? The E30 fitment BBS RS typically came in 15x7 and 16x7 ET25 from what I recall, so widening them at all pushes the offset lower. Anything more than .5" of extra width on them basically means going past the optimal point for tire clearance, and really becomes an aesthetic mod rather than performance. For example a wheel with a 1" lip (becoming 7.5" wide overall) would become ET19, and that is about the limit to fit nice wide tires. An 8" wheel becomes ET13, and you're pretty much stuck with stretched tires at that point. Of course it's all personal preference, I'm just pointing out what you can and can't work with. I don't know what offset the G60 RS' are, find that out and I can help you. The G60 wheels are 15x7 et25. If I wanted to make them into 8" wide rim what would the offset be and would I still have issue if I ran 225 tire? There is a set of baskets that I am looking at in a setup of 16x9 et0. If I was to reduce the lip to 8" width what would be the offset? Would I be able to run these with the 225 tires witout any issues? In your post I am not quite sure what tire you are reffering to when pointing to the 7.5" rim maximum size for performance. I was thinking that the 225 shouldn't have a problem with 8" wheel? I'll address your questions in order, there's a lot of info here. First, the wheels are 15x7 ET25. The offset of a wheel is measured from the centre of the barrel to the hub, meaning that when the wheel has a positive offset (i.e. any wheel without ungodly dish), making it wider via larger lips makes the offset lower by exactly half of the lip added. In the examples I was giving above, a 7" wide ET25 wheel becomes 7.5" ET19, 8" ET13, 8.5" ET6, 9" ET0, and so on. The offset has to plunge downwards, it's just physics. Now, why that is bad for you. The hub to fender geometry on an E30 does not allow such aggressive (sub-ET20) offsets, as they will make the wheel protrude from the wheelwell. As we all know from "Euro" styled cars, you can still drive a car like this with narrow tires, as thr tire will be pulled into the fender due to lack of width. In essence, the widest you can make a wheel that started out as 15x7 ET25 fit under an E30s arches with 225/50/15 tires is approximately 15x7.5" ET19. Anything wider than 7.5" and you will be contacting the fender. Of course fenders can always be "encouraged" to accept more tire, but this is up to you on how much you want to spend. A 16x9 ET0 wheel toned down to 8" of width becomes ET13. In fact, the geometry of that wheel indicates that is has exactly the same hub geometry as a 7" wide ET25 wheel, the numbers I stated above apply directly to this wheel, also. To be clear, what I mean here is that if this wheel had the same 1" lip as the stock 15x7" ET25 wheel, it would also be ET25. It is just a severely widened version with the same dimensions. Lastly, 225's would have no issue with 8" of wheel. It's just that with the wheels you are considering, if you make them 8" wide they will stick outside the car, and getting properly sized tires on them means you will have to do something about the fenders (pulling, likely painting afterwards, etc). Wheels such as 15x8" ET22 Kosei K1s will take 225's with no problem, since they would be about 1cm further into the car on each corner. Hope that helped, don't be afraid to ask for any clarification on this. So just to confirm then, with 8" wheel on e30 there will be fender rubbing isues both in the front and in the rear and both fenders will have to be rolled. How much will the fenders have to be rolled? Is it possible to just get away with rolling the lip of the fender or is actual stretching of the fender required? 8" can be run with proper offset, ET22 for example. Baseball bat the fenders if you are going for performance. As Tomek said, 8" of wheel with a proper sized tire is about the limit as to what will fit without a lot of work. In fact 15x8" ET22 with 225/50/15 tires will likely only rub slightly in the rear (semi-rolled lips from the factory back there), so there is little work involved. If you really want to jam as much tire as possible into the fenders, 17's are the way to go. There is more strut clearance as you go upwards, and the tire choices are much better. Shoving 245's all around with 17's isn't very difficult. Also, keep in mind a stiffer suspension means more rubber. I'm running 225's on an ET25 wheel, and I have never rubbed a thing. This is exactly what I had in mind except 8" in the fron as well. You can fit 16x8" ET15 with like 205's, but 225's would require some good rolling. I say do it though, that would look hot. BTW. I have seen an e30 Red 318is with rims that im pretty sure were what im describing anyone know if that dude is on the foum? A few problems here. First, finding 4x100 to 5x120 adaptors; they aren't at all common. Second, the Style 5 rims are 17x8 ET20 (and 17x9 ET26 on later models). Even if you did a 5-lug swap (using E30 M3 parts), these would completely fill out the fenders, and you would have to run a relatively narrow tire to avoid rubbing. Now, think about using adaptors instead. They would have to be at least 20-25mm thick, and would push the wheels out by the same amount; no way in hell of fitting those. I know of one non-M E30 running Style 5's, belongs to a guy on R3VLimited. 17x8 and 17x9, E30 M3 5-lug swap, 215 tires all around (extremely stretched on the rear, obviously). 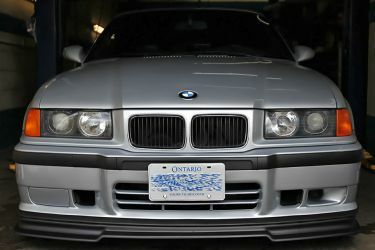 Lots and lots of M3s running around with them, though. I once had BBS RS replicas, 17x7.5" ET27. Are you thinking of my car?